Risk is Where It's At! When Henry Ford got into making affordable cars off an assembly line, automobiles were for the rich, snooty, Downton Abby-types. President Woodrow Wilson called the automobile the “new symbol of wealth’s arrogance." Of course, we know how Ford changed all that with the Model T.
The real question is "why?" You see, at the time no person or company of money or influence even thought of the automobile as a commercial possibility - something to sell to the common man. Ford's business manager even said "...that Ford was thrown out of so many offices in Detroit that one time he just sat on the curb and wept." I know, I know - it's most likely apocryphal, but it's one of my favorite sales quotes. But think about it - Henry Ford wasn't responding to customer feedback. He certainly wasn't waiting for an RFP. In short, he wasn't interested in hearing what the customer wanted. Instead, Ford himself, personally, had the vision for a motorized America - and he moved forward, tirelessly, to make cars for the multitude of Americans. Cell phones, email, the internet, indoor plumbing - as human beings we have lived without ALL of these longer than we've had them. And if you'd waited for Ghengis Kahn to tell you that he wanted a bidet or the ability to play fantasy baseball on his phone while at the dentist's office, you'd still be waiting. Everyone from Steve Jobs to Malcom Gladwell have spoken about how the people don't know what they want until you show it to them. Think about it - every thing you use daily, television, radio, tablets, air conditioning in your car - it's all there not because people were begging for it - it's there because innovative minds created it and innovated pitchmen (salespeople) created the need for it. So why, as a professional salesperson, are you waiting for your customer to tell you what they want? Unless you're selling a commodity that the customer trades in regularly, where price is the only deciding factor, your customer or prospect has no idea whether or not they need what you are selling. If you leave it up to the prospect, they will NEVER need you have. In the 1990s it was your job to uncover the needs of the customer and make the case for the product or solution you represented. In 2015, it's time for you to SHOW them what they can't live without. . While this sounds easy or rather basic - it's not. In a previous post I talked about Sales Managers and the need to convince reps we can sell in the modern era. Well, this time, it's all about the sales-rep - because if you're waiting for your sales-manager to help you sell, you may be waiting a long time - or not so long, if you're far behind your plan. Here are is one observation and one insight I can give you - hopefully these will help you figure out a way generate interest in your prospects. Observation: Everybody is worried about something - So you think asking a prospect what keeps you up at night is the recipe for uncovering a need? Well, if it's 1993, you must be Top of The Board. But, it's not. In 2015, you need to show your prospects what should keep them up at night. We are all worried. About the economy, about our jobs - retirement, environment, the high price of milk or radial tires...whatever it is, we all have worries. Most, if not all, of those worries center around RISK. Whether its the choices I make investing in my 401k, the foods I feed my children or the projects I take on at work - in my personal life, I am always managing risk. I would bet real money it's the same in your life. Insight: Most decision makers are worried about risk more than anything else. They are deathly afraid of making a bad decision that costs the company money and potentially costs them their job. Whether it's risk of litigation from not being compliant to a government edict or risk of losing market-share by not being competitive enough, modern decision makers want to mitigate risk. Expose and show the customer is at risk, and you've got a sale brewing. How do you do this? By offering insight into what is going on in your prospect's world. Knowing your market is more important than ever. Back to Henry Ford - In 1908, almost 50% of America's pollination lived in large cities and 90% of them worked for small businesses under 20 workers. The average wage in 1908 was 22 cents per hour. The average worker made between $200 and $400 per year. Now look at the ad from 1908 at the top of this article. Ford advertised to merchants and businesses - his value prop? 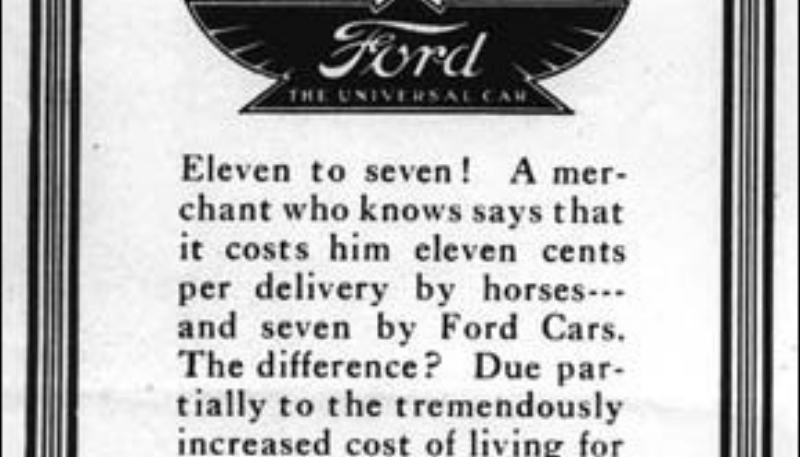 11 cents per delivery to keep a horse, 7 cents to deliver by Ford. If you do the math - if one truck made 25 deliveries a day and delivered six days a week - the savings from one truck could hire another worker. Ten trucks? Ten workers? So if you, as one of America's small business owners, didn't buy a Ford Truck, you risked not being able to compete and expand your business. You risked not being able to compete with the bakery, or tool shop or pharmacy down the road that bought a Ford Truck. You were risking your lively hood. Ford exploited that risk and changed America. Now we're not all Henry Ford and all of us don't represent the Model T or the iWatch or the next newfangled thing we can't live without. Yes, you need to look at marketing data and customer surveys - but you need to expand your line of vision. You need to look at things from the other side. Tough talk coming here: you need to stop letting your customer do YOUR job. If they call you and ask "How much is X because I think I need it" you have failed. You are in the showing business. Not the telling. You are there to offer insight, to challenge and yes - to say "you're wrong" to a customer or prospect. As a modern sales person, you need to play to win, not to "not lose." And if you're competing against me or my team and waiting for a prospect to tell you their needs? Well there's coffee's in the lobby - sit down and relax. I'll be in the conf room showing them what they can't live without. As always, I am interested in your feedback? What do you think? Am I on the right stack of mail? Let me know!